I know that Rhino is not the most suitable software for volumetric rendering, but I had a bit of time and decided to try it out. 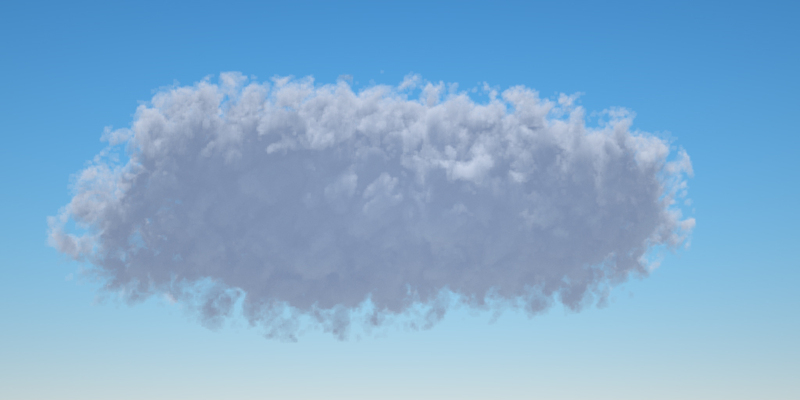 In the standalone I associated a .vdb cloud to the Render Target, modified the density, absorption and scattering parameters to get the effect you see and exported it to the orbx format. In Rhino I created a box, turned it into a block and linked the previously created .orbx file within the octane render tab 'Geometry'. The only mirrored parameters are absorption and scattering, while for density it keeps those of the original .vdb file. Is there a particular procedure to follow to be able to modify the object in rhino? I hope it is much simpler the procedure than it seems to me. Hi - it is much easier to do this by using the plugin proxy system to load an ORBX or OCS containing the VDB file and it's material. face_off wrote: Hi - it is much easier to do this by using the plugin proxy system to load an ORBX or OCS containing the VDB file and it's material. Set the VDB up in Octane Standalone and save as vdb.orbx. In Rhino, add a plane and convert it to a Block Definition. Then select the block, and in the Octane Geometry tab click Load ORBX and load vdb.orbx. That's what I did Paul, but I did not add the geometry out node. I think the problem is not that (it works even without that node), but it's a scale problem. The original size of the vdb cloud is much larger than the block I want to associate with. When I scale the block, to get the desired size of the cloud, it also scale (down) all the values associated (density and volume step length). Is there a way to make the vdb geometry fit the block, so that I know exactly its position and dimensions? sgufa wrote: That's what I did Paul, but I did not add the geometry out node. I think the problem is not that (it works even without that node), but it's a scale problem. ... I got the same problem... I can use the custom scale options in the octane geometry tab, but since e.g. the fire.vdb file ist huge, it is sometimes not enough to scale it down to 1 % (which is the lowest possible value...) is there a way to scale down the vdb volume in standalone? Hi - you need to scale the VDB inside the ORBX. face_off wrote: Hi - you need to scale the VDB inside the ORBX.